The origin of the Guinness Book of Records is, of course, within the Guinness brewing empire. As the pub trade developed, food became an important (arguably the most important) factor in the business. Guinness was aware of its importance from the 1950s, and Guinness Publishing continued to promote food and drink through many of its publications. This section of our site has details of some of the books published by the Guinness group in this area. An honourable mention has to go to the wonderful "Guinness Recipes" from 1954. This is a compilation of a series of guides (with added recipes) which appeared in Country Life, The Field, Illustrated London News, The Sphere, Sport and Country, Tatler and Bystander, Geographical Magazine, Scottish Field, Scotland's Magazine, Punch, and The Family Doctor in 1953. Shellfish, Sea Fish, River Fish, Country Dishes, Savouries, Game Birds, English Cheese, Cooking with Guinness, and Cake Cooking with Guinness. In 1985, Guinness produced a limited edition collection of miniature bottles of Guinness from East and West Malaysia, Singapore, Thailand, Indonesia and the United Kingdom. 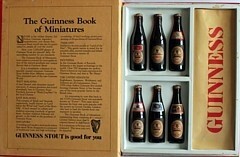 Bottle liners (24 red or 48 black) could be exchanged for the "Guinness Book of Miniatures" up to 16th August 1985. Notes We have copies of advertisements promoting this offer from the Malaysian New Straits Times from June and July 1985. Finally, the ultimate "Guinness book of ..." — privately published by Guinness Publishing in 1988, the "Guinness Book of Guinness" is an anthology based on the first 50 years of the Park Royal Brewery in London.